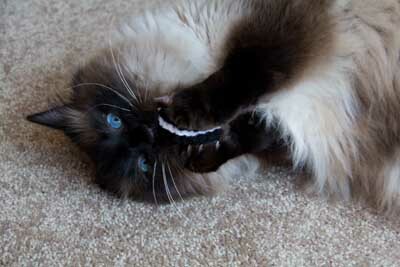 All cat toys are made with 100% organic catnip and valerian root. All items are hand crocheted. Please message me if you have any questions! Thank you for visiting my shop! Any purchase is guaranteed to bring joy to you and your feline friends. This is art I can sink my teeth into (or my claws). The shop owner contacted me to see if I’d be interested in reviewing her products. We got a Crinkly Cat Candy Toy, a Cat Banana, a Cat Oreo and a Jingle Gumball. The Woman left everything in the package until she had a chance to let us see the opening of it. Ichiro was right there and Gemini wasn’t far behind. I was having a nap. Ichiro went right for the nip banana. Okay, that one wasn’t in a plastic bag with the others. He immediately got his nose and stink all over it and fell over and started bunny kicking it and chewing on it. He seemed to like that he could wrap his little toenails around the yarn and hold onto very tightly while he pulled at it and tried to eat it. When he got tired of that, he investigated the others. The crinkle ball got some attention, then the gum ball and then he settled down to the nip Oreo which he’d toss in the air and then start attacking. At some point during this time, Gemini came down. She’s a much nicer player. 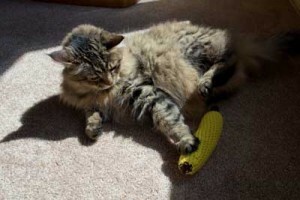 So she’d rub her head on the nip banana and then start rolling around, pawing at it, but never quite grabbing it. 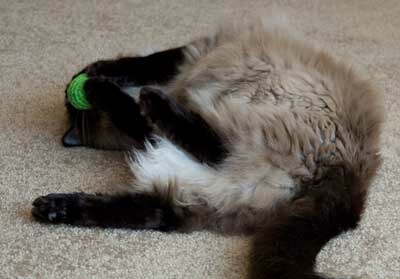 Then she’d get up and rub her head on it again and start rolling around, looking happy. The Woman brought the camera and toys up to me and I sniffed at them and left. Later I gave that Oreo a go for its money. I mean, Oreos, cats! Oreos! We never get those! The woman was surprised thinking I’d love the crinkly ball but I liked that Oreo. And really–you know me. I hate to be predictable. As for pictures, do you think I perform on camera? Mango was a shelter kitty that my husband and I adopted when we first moved intogether and was our first pet as a couple. My husband loves orange kitties and she more than lives up to her redhead reputation. She is quite the sassy trouble-maker and always making our lives more interesting! Voldemort was a rescue. I found him one night on my door and while he was very skittish, let me pick him up and bring him inside. It was definately not our intention to get another cat, but I fell in love as soon as he let me pet him. It turns out he was incredibly sick with a major UTI that he must have had for a very long time. Since recovering from that, he has had other urinary issues as well, which has been quite the learning experience for us and also quite a challenge. I am a huge advocate for spay, neuter, and adopt. I have had my share of “rescue kitties” and finding them homes is always sucha challenge. A huge percentage of cats are given up to shelters and euthanized every year because of urinary issues and my experience with my own cat really helps me to reach out and educate owners about cat health and behavior. I work as a vet assistant at a large veterinary clinic, which gives me opportunity to share my knowledge with frustrated cat owners. Education is so important and BrumbysYarns has put me in touch with like-minded cat owners and enthusiasts across the country and really allowed me to help get the word out there about the over-crowded shelters across America and the thousands of stray cat colonies. I hope as my company grows, so do my opportunities to educate anyone who will listen. Yes, this review was solicited, but if you doubt our sincerity, take a close look at those photos. No cats were unhappy about this post. The compensation we received were the above mentioned toys that were sent to us by the owner and the satisfaction of a toy well tested. Those sure look very, very interesting…and fun! Ha! 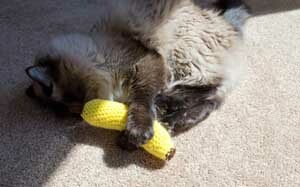 I thought that was a corn cob at first, but no….banana! Those toys look like they were made with love — and, of course, the nip and valerian root doesn’t hurt either! What a PAWerful combination! No wonder you three all went crazy. Of course, you Chey are the pickiest, but you still couldn’t resist when all was said and done. We’ll have to go and have a look. Domino’s birthday is coming up next month. Those look like terrific toys, that is for sure and they are my kind of people, preaching the spay and neuter. That is so important. And good for him to try to educate people about the care of their cats. We sure will check out their shop. Thanks for this review. Great review ! We can attest to their quality and will be featuring them as part of our “homegrown” giveaway next Friday at Cat Wisdom 101. Those look like grand toys!! We thought it was corn on the cob for a minute. If it’s got nip, then it’s a hit!!! Mom you’ve gotta check this out. Hello gorgeous Miss Gemini. YOu look very happy playing with that nanner. those toys are just adorable!!! Thanks so much for sharing them with us!